Yixing Clay Tea Cup is hand made yixing zisha clay. Yixing Clay Tea Cup is brand new tea cup so just rinse it with hot water and start seasoning it with your favorite tea. Yixing Clay Tea Cup has a clay strainer with it as well. 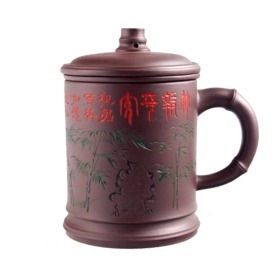 It is a very good cup for brewing Chinese Tea.